Hungry critters will eat your fruits and vegetables. That’s just the reality you face as a gardener. But different animals threaten your garden in different ways. The four main ways to protect your garden from animals are use a spray, build a fence, build a wireless fence, or use garden row covers. If you don’t want deer fencing, try my Garden Commander row covers. My garden row covers are inexpensive, are expandable, and fit in a traditional sized raised bed. Even better, they are very simple to install. Just place them over your plants and they are installed. How do the different methods of animal protection stack up? When you use a spray, you have to remember to keep spraying, especially after it rains. If you want to use a spray repellent, here are some ideas. To keep Deer and Elk away spray your plants with egg spray. To make this spray mix 2 eggs with 8 cups of water. Put the mixture in a bottle and spray. Rabbits, squirrels, and most rodents will not go near pepper spray. To keep bugs off your plants, simply rinse them with soapy water. Use 2 tablespoons of dish washing detergent to a gallon. Remember to spray again each time it rains. Installing a deer fence costs a lot of money, is ugly, and can be difficult to install. Large deer fencing does work to keep the animals out of your garden. However they are unsightly, difficult to install, and can be very expensive. 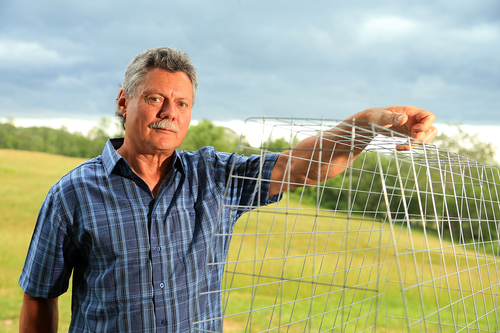 If you want to consider deer fencing, here are some ideas. KEEP ANIMALS OUT OF YOUR GARDEN NATURALLY! Never need repellents or tall deer fencing. This Deer Deterrent Works. We Are Farmers. We Know Gardening. We Learned The Old Fashioned Way How To Keep Deer Out Of A Garden. Frustrated at keeping the deer and wild animals out of our garden, we created the perfect solution, a cage cover system we call The Garden Commander. We originally designed our row cover to stop deer from eating our plants and vegetables. Then we discovered by adding end caps that we could repel smaller animals from eating our vegetables, such as rabbits, squirrels, birds, ground hogs and more. Our garden row covers have been selling locally at garden shows for years. Our system works so well we have decided to share them with you to help you with your wild animals in your garden. Our natural deer repellent protects gardens without expensive, unsightly, tall deer fencing. It’s the perfect organic pest control without using costly, earth damaging pesticides. To learn more about our garden covers, and how they work, please read our FAQ.